Issue Tracker helps you maintain the security and efficiency of your computer by automatically identifying problems on your computer and helping you to fix them. For example, Issue Tracker will alert you if you have too many startup programs/services (can cause computer slow down); an inefficient registry (can also cause slow down and crashes) or your hard drive contains files that might compromise your privacy. In many cases you will be presented with a simple wizard that will allow you to deal with the issue quickly and easily. If the problem is beyond the scope of Issuer Tracker, you will be offered the opportunity to contact a GeekBuddy representative who will help resolve the issues. To start the Issue Tracker, click the 'Issue Tracker' link on the right top in the user interface. 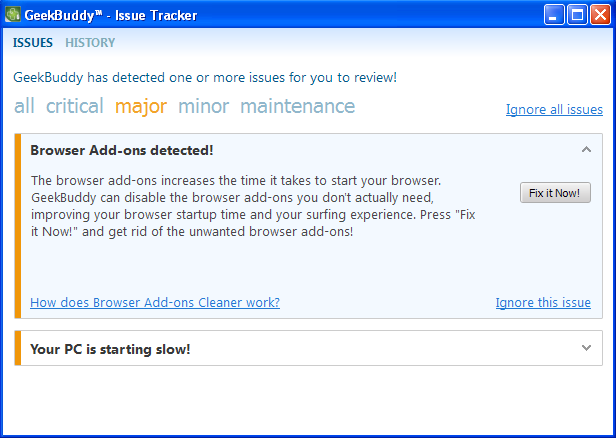 The Issue Tracker interface will list the problems that it has detected. 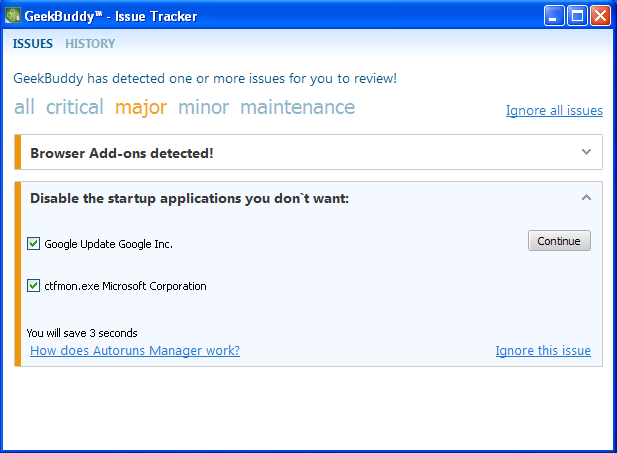 At the time of starting your computer, Issue Tracker will detect problems in your system and provide an alert at the bottom right side of the screen. Click the Fix issues to open the Issue Tracker interface. The problems detected will be categorized as critical, major, minor and maintenance issues. Click on the relevant link to view the problem. Clicking the 'Show all issues' link will display all the problems in your computer and the color code at the left of each issue indicates the category of the issue. Some of the common problems that occur in any computer are junk registry entries, slow bootup time and the presence of files that might compromise your privacy. Each issue discovered will be accompanied with a ‘Fix it Now’ button. For example, for the issue of slow bootup time, clicking this button will display a list of startup programs in your system (programs which are automatically loaded during Windows start-up and will running in the background). You can identify the programs you do not want to run at start-up and disable them. Doing so will save system resources and improve the performance of your computer. Select the programs that you want to disable during startup and click the 'Continue' button. The selected programs will be disabled and the successfully completed screen will be displayed. Provide your feedback at the bottom of the interface and click the 'Close' button. For some of the issues listed, you have to seek the help of an expert technician. 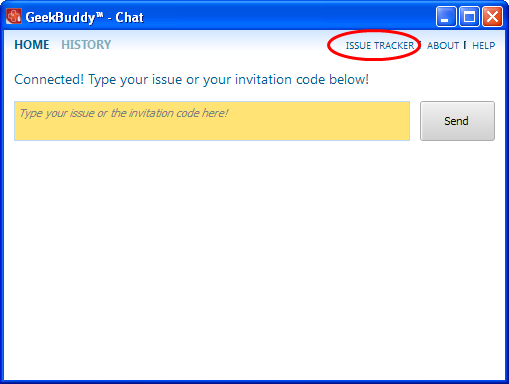 Click 'Ignore all issues' link to disregard all the issues in your system displayed by Issue Tracker. Click 'Ignore this issue' beside a particular entry to disregard that problem. Click 'History' link at the top of the interface to view the actions taken for the problems. Click the 'Fix it Now!' button beside an issue to resolve it.